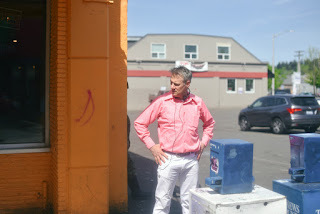 If It's Too Loud...: Selector Dub Narcotic - "Hotter Than Hott"
Selector Dub Narcotic is a new project from the legendary Calvin Johnson. In case you don't immediately recognize the name Calvin Johnson, he founded K Records as well as the highly influential bands Beat Happening, Halo Benders, and Dub Narcotic Sound System. Selector Dub Narcotic is his collaboration with hip hop producer Smoke M2D6. Calvin Johnson doing hip hop sounds like a weird, weird combination, and you'd be right. I can't say that "Hotter Than Hott" is a good song. Odd is probably a better description. But it is fun. And highly infectious, especially as it goes on. It's worth at least a few listens. It is Calvin Johnson, after all. But there's also a good chance you'll become obsessed with the song after the third listen. You might thank me (or be furious with me) later. Selector Dub Narcotic's album, This Party is Just Getting Started, will be out September 16 on K Records, of course. You can watch the video for "Hotter Than Hott" below.